Explore another galaxy with this whimsical space design. Fun colors of blue, orange, yellow, and green make this space exploration come alive. 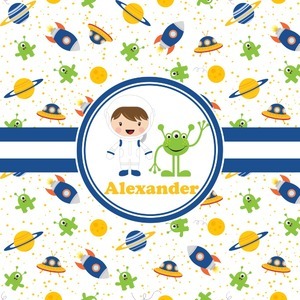 The design is full of little green martians, blue and orange rockets, blue, yellow, and orange spaceships, yellow and blue planets, and yellow stars galore. A blue and white band is placed in the middle of the design and used to showcase your little space traveler and his martian buddy. Add your own personalization for that special touch.